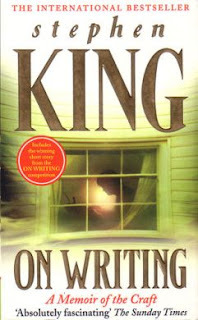 As a big fan of King and an aspiring writer, I loved this book! I had been wanting to get my hands on this book for a while but just never bought it. When I received it in the mail I immediately began reading and was immersed into little anecdotes about King's childhood. To put it simply, the first 100 or so pages was about King as a child and how he discovered his love for writing. The next 100 or so was on the craft of writing. He began by talking about the writer's 'toolbox' and then proceeded onto the mechanics of writing such as grammar (though, he didn't stall too long on that one, it is generally something every writer should know) and other such things. He talked a bit about ideas and plotting. He went through how he came up with the idea for a few of his novels. He also spoke about how to get published and what you have to do if you are serious about writing. King used a lot of motivational techniques in this book because once I was finished reading the 'on writing' section, I was pumped and wrote about five thousand words in a couple of hours. The last part was about the time he got hit by a van and almost gave up on writing. He described what happened and how he recovered and began writing again. It was around 50 or so pages which was the perfect length for such a thing. If it went on any longer I would imagine it would become very tedious and whiny. Throughout this book, King spoke a lot about his wife, Tabitha and how she helped him. I found this particular aspect of the book very interesting and I began to really like this woman by the end. I also gained a lot more respect for King as a writer than I had previously. I always respected him but his very blunt way of putting things and down to earth style of writing he used allowed me to "get to know him", if you like. Overall I really enjoyed this and would recommend it to any King fan or aspiring writer.